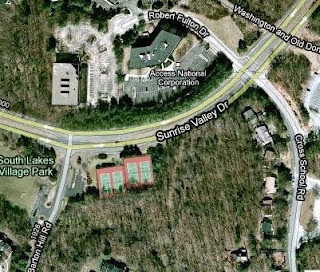 That's the headline in a Post article about a crash in Reston in which a cyclist, who was headed east on Sunrise Valley Dr toward the W&OD Trail, was struck by a motorist heading west on Sunrise Valley, turning left onto Barton Hill Rd (map). According to the Post, "The bicyclist was flown to Inova Fairfax Hospital with life-threatening injuries." This is the site of at least one other recent crash (as noted in the comments on the Post article) under the same conditions. Cyclists at this point are headed downhill going very fast. Inattentive motorists are looking for cars and trucks. The setting sun is lower in the sky and could affect visibility. However, since many cyclists ride this stretch, this motorist must have known to look for cyclists. I ride this stretch almost daily and always watch for oncoming vehicles. I also wear bright clothing. I think it does make a difference in these situations. According to the League of American Bicyclists, oncoming vehicles turning left in front of cyclists is one of the most common causes of motorist/bike crashes. We've discussed the crash with Reston police and we're awaiting more information. We do know the cyclist suffered closed head injuries and a collapsed lung. We haven't heard a name mentioned yet. Do bike-friendly areas attract more businesses? These companies are getting a jump on a major cultural and demographic shift away from suburban sprawl. The change is imminent, and businesses that don't understand and plan for it may suffer in the long run. To put it simply, the suburbs have lost their sheen: Both young workers and retiring Boomers are actively seeking to live in densely packed, mixed-use communities that don't require cars-that is, cities or revitalized outskirts in which residences, shops, schools, parks, and other amenities exist close together. "In the 1950s, suburbs were the future," says University of Michigan architecture and urban-planning professor Robert Fishman, commenting on the striking cultural shift. "The city was then seen as a dingy environment. But today it's these urban neighborhoods that are exciting and diverse and exploding with growth." We've seen this shift in the increase in people who are choosing bikes for transportation. They are mostly younger people who are sick of being stuck in traffic, of paying $3/gallon for gas, and who want better bike facilities. Communities like DC, NYC, and Arlington County understand this shift and are changing their environment in response. Older, less progressive communities like Fairfax are finding it difficult to move away from the older mindset of moving more people in more cars on wider roads. Many factors go into the decision-making process for locating a company. Countering the desire for being in livable, compact communities is the short-term desire for cheaper real estate. See a recent post at Greater Greater Washington with a good discussion of this topic, including a letter from Stewart Schwartz of Coalition for Smarter Growth encouraging Northrop Grumman to choose the transit-oriented Ballston location over the suburban office park location in Fairfax County. The Fairfax site is very bike-unfriendly, adjacent to the Beltway and Rt 50. It's nearly impossible to cross the Beltway on Rt 50 on bike; that stretch of road is like an interstate with several exit/entrance ramps. There's no connection to the street network to the south. The site is nearly an island, a symbol of the days of bad suburban design. It was a beautiful but cold Bike to Mason Day yesterday. We talked to many students, faculty, and staff about our work, to hand out county bike maps, and to tell them about our newsletter. 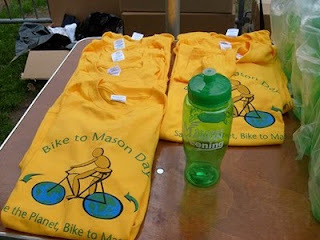 Josh Cantor of the GMU Transportation Department has done a great job of holding this event for the past several years. Due to conflicts with the academic calendar it's held earlier than the regional Bike to Work Day events. Josh is working with Commuter Check to provide vouchers for bike commuters who are Mason employees as part of the GMU Commuter Choice program. We also had a chance to check out the GMU Bike Village. Christi gave us a tour of their space, located in the ground floor of one of the parking garages. Soon they hope to have donated bikes ready for their bike share/rental program. The Centers for Disease Control has been studying the linkage between our transportation system and health. "In 2007, representatives from CDC created a Transportation Policy Group to develop a more comprehensive approach to identifying and addressing issues related to transportation and health. Their efforts have extended to include work with the U.S. Department of Transportation, as well as non-federal partners such as the American Public Health Association (APHA) and the Healthy Eating, Active Living Convergence Partnership (Convergence Partnership)." The current U.S. transportation infrastructure focuses on motor vehicle travel and provides limited support for other transportation options for most Americans. Physical activity and active transportation have declined compared to previous generations. The lack of physical activity is a major contributor to the steady rise in rates of obesity, diabetes, heart disease, stroke and other chronic health conditions in the United States. Motor vehicle crashes continue to be the leading cause of injury-related death for many age groups. Pedestrians and bicyclists are at an even greater risk of death from crashes than those who travel by motor vehicles. Many Americans view walking and bicycling within their communities as unsafe because of traffic and the lack of sidewalks, crosswalks, and bicycle facilities. So says Transportation Secretary Ray LaHood in a recent post on his Fast Lane blog, What we know about bike infrastructure: people want it. Secretary LaHood gets it, better bike facilities help everyone by reducing congestion and giving travelers alternatives to driving. Why devote resources to a transportation mode that fewer than 10% of the nation is using? Well, bike infrastructure is relatively inexpensive--particularly if you compare it to, say, adding a lane to an existing roadway. 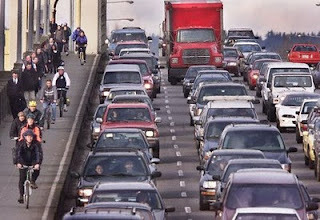 Now, imagine if those people who do bike around chose instead to make all of their trips in single-occupancy vehicles. Our already congested roadways would be brought to a halt. So, even for those folks who have no interest in bicycling, this relatively low investment actually pays dividends for those who still choose to drive. Everybody wins. Bike Commuters And the fact is, as Washington, DC, DOT Director Gabe Klein noted on NPR, "We see a direct correlation between our investment in bike infrastructure and an uptick in usage. When you make it hassle-free and inexpensive for people to use a certain mode, they will use it." I'll say it again--because I want my online friends in commercial trucking and the people who make their living behind the wheel, to know--we are not out to make their jobs any harder than they already are. I know they're paying a lot of taxes to use the roads, and I appreciate that fact. But we're talking about making their jobs easier by taking vehicles off those roadways and easing congestion so the trucking community and bus and taxi drivers can deliver their goods and passengers more smoothly. Look, in the 54 years since President Eisenhower launched the interstate system that connects America, we've committed almost all of our transportation resources to highways. Part of our commitment now should be to create alternatives to congestion. 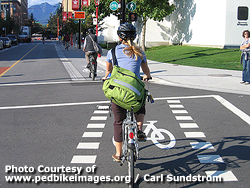 We know that making biking and walking safer creates more livable communities. It makes Americans healthier at a time when the US military has indicated that 27% of recruits are too overweight to qualify for service. It lowers greenhouse gas emissions. It reduces our dependence on foreign oil. And it's what Americans have said they want. If you travel to the GMU campus tomorrow, why not go by bike and celebrate Bike to Mason Day from 6am to Noon tomorrow? Coffee, juice, fruit, muffins will be available from 7:00 AM – 10:00 AM to registered riders. Richard Layman maintains the blog Rebuilding Place in the Urban Space where he writes about urban revitalization and transportation. 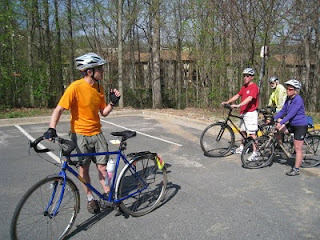 In a recent post entitled Best practice bicycle planning for suburban settings using the "action planning" method he discusses his ideas for increasing bicycle mode share in the suburbs as presented at a ReThink Montgomery session. Layman and Casey Anderson, a Montgomery County bicycling advocate and WABA Board member, gave presentations as part of the Infrastructure component of ReThink Montgomery. A video of the presentations is online as is Layman's slide presentation. Casey's talk was entitled Bicycling in DC and Its Suburbs: Attitudes and Experiences. In his attempt to portray cyclists as road-clogging scofflaws ("Cyclists make roads more dangerous," April 14), Mr. Ward Rowe reveals himself as one of those uninformed motorists who feel that cyclists have no rights. His prejudices and behavior behind the wheel will only serve to endanger all those who share the road with him, - whether they use autos, bicycles, motorcycles or mopeds. I encourage Mr. Rowe and others who are like-minded to familiarize themselves with the Virginia vehicle laws regulating bicycling on Virginia's public roads. (www.vdot.virginia.gov/programs/bk-laws.asp). 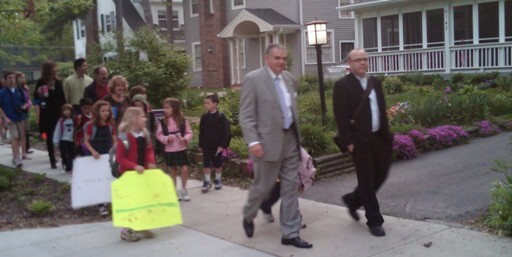 On his popular blog Transportation Secretary Ray LaHood describes walking to school recently with his 2nd grade granddaughter Ella. They formed a "walking school bus" which is a great alternative to driving kids to school. Parents take turns leading a group of kids who live near school and they all walk together. Taking turns, parents would only have to dedicate a day or two leading the bus. Sec. LaHood is setting a great example for the rest of us, stressing the need for better non-motorized facilities and acknowledging the fact that most of our transportation funds in the past have gone toward building infrastructure for cars and trucks. He definitely walks the walk. Isn't it time that Fairfax County got on the walking school bus? Meanwhile, other kids from the school joined the "bicycle train," sort of a walking school bus on wheels. And, since I can't be in two places at once--I really wanted to!--today's special bike train guest was a great Safe Routes partner, Andy Clarke, President of the League of American Bicyclists. There is some Safe Routes to School activity happening locally. Parents at several Vienna schools are again planning a Safe Routes to School Challenge during Bike to Work Week, May 17-21, including a planned bike train to Wolftrap Elementary School. We'll post more info about this event later. That's the title of a photo spread in the Post's new business publication Capital Business, page 37, on the surge in bike commuting in the District. Where did all the bicyclists suddenly come from? 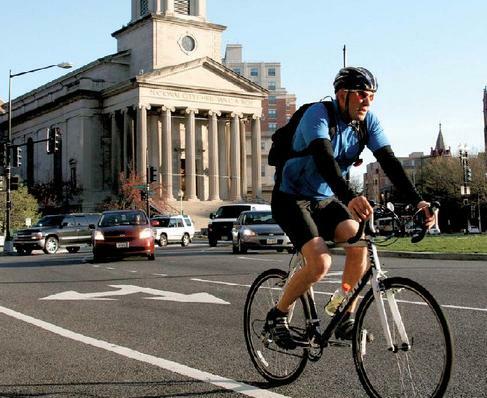 The District is among the top cities in the country for commuting to work using two wheels, boosted by a number of trails connecting it with the suburbs and beyond. On the NPR program All Things Considered (A National Network Of Bike Trails? It Could Happen), Secretary LaHood continues to stress the need for better bike facilities in the U.S. He's a cyclist who regularly gets out on his bike: "My wife and I have our bikes in Washington and on the weekend, sometimes both days, we are on the C&O Canal and we see thousands not hundreds of people out on bikes. My wife and I appreciate being able to get out on bikes." LaHood is also floating the idea of a nationwide interstate biking system - the two-wheel equivalent of Eisenhower's highway system. Some advocates for drivers and truckers are worried that this new focus on biking could divert resources from roads. But LaHood says the Department of Transportation isn't looking to take away anyone’s turf - just to provide alternatives. "We know that 90 percent of the people aren't going to be cycling to work," he says. "But that opportunity and that option and that kind of alternative is something we think people want." Despite the NPR headline, the national bike route is an on-road route being developed by Adventure Cycling Association. 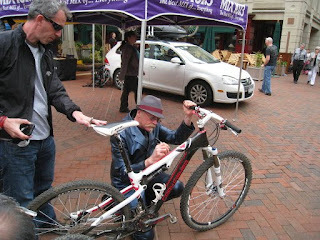 Despite the wet forecast, there was almost no rain during Paul's Ride and Cyclefest yesterday. 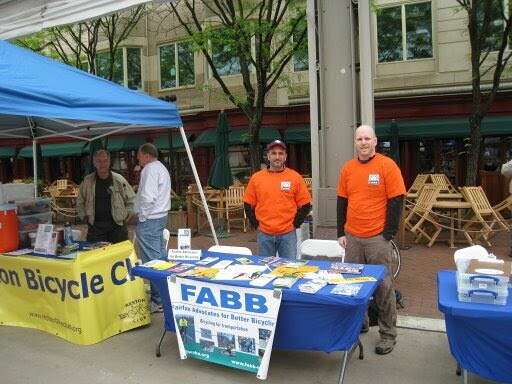 A good crowd turned out to raise money for the Washington Regional Transplant Community as part of Paul's Ride, to test ride bikes, see the legendary Gary Fisher, and to get some great bicycle-related info from the FABB crew. 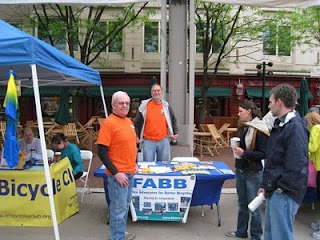 Nearly 40 cyclists signed up to receive the FABB e-newsletter (the next edition is due next week). Arlington County does so much more to promote biking than Fairfax County. Now that the bike program funding has been cut, Fairfax will be doing even less. Much of that work is being done by BikeArlington, a program of Arlington County Commuter Services. One of the great promotional ideas initiated by Arlington Commuter Services is their Car-Free Diet Challenge which got underway yesterday. People who currently drive and are skeptical about the benefits of getting around without a car were asked to apply to become the Car-Free Skeptics. They will go car-free for 30 days and share their experiences on carfreediet.com. During the challenge they will use the car-free diet calculator which will determine "how much money you'll save, calories you'll burn and CO2 emissions you'll reduce when you go on Arlington's Car-Free Diet!" See a video of the challenge kick-off. 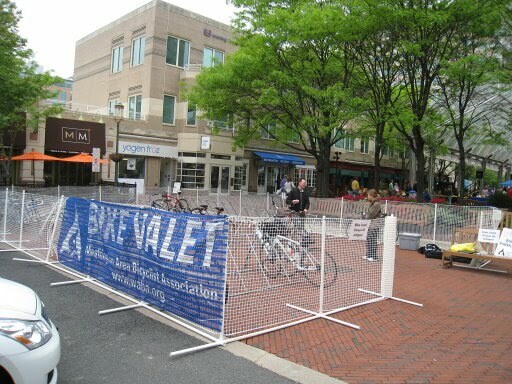 While the Fairfax County government is doing little to promote bicycling, The Bike Lane, located in Burke and the Reston Town Center, is doing their part. They will award a Trek Ride+ electric bike to the lucky winner of The Bike Lane's Give Up Your Car for A Year Challenge, at Cyclefest in Reston tomorrow. As we reported earlier, the Fairfax County Board of Supervisors will cut all operating funding for the bicycle program at their April 27 Board meeting. While the Board claims there will still be $5,000,000 for bicycle facilities, that amount, which is spread over 5 years, is now about $1,250,000 due to decreases in the Commercial & Industrial tax revenues. Spread 5 years, that's about $250,000 per year, to build about a little over 1 mile of paved trail or a fraction of the cost of the short stretch of bike lanes recently installed on Gallows Road (when cost of planning and design are included). In a county with over 1,000,000 people, that's a pathetic amount of money for building bicycle infrastructure at a time when more people are riding and more want to ride if there the county were a better place to bike. County cyclists should be outraged. First Supervisor Cook claims that bicycling is not a form of transportation. Then Supervisor Herrity suggested cutting the bike coordinator position. The position remains, despite strong arguments for eliminating the position during the budget mark-up, but there will be no operating funds. What will cyclists do to protest these cuts? Ideas? Do we have a critical mass of cyclists out there who are upset about these cuts? Update: The Commercial & Industrial tax may now be in jeopardy. A company is suing Fairfax Co, claiming the tax should include residential property. Paul's Ride for Life will be held tomorrow starting at the Reston Town Center pavilion. You can register on-site for $30. There are two ride options, 10 and 35 miles, both out and back on the W&OD Trail. If you're not part of the ride, expect the trail to be more congested than usual between Reston and Ashburn. This year Paul's Ride is part of Cyclefest 2010 sponsored by The Bike Lane. A full day of events are scheduled, starting with Paul's Ride at 8am with Cyclefest exhibits opening at 10am. 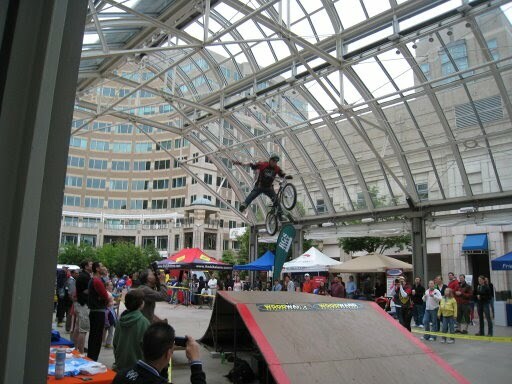 Trips for Kids will hold a bike rodeo, there will be several BMX stunt shows throughout the day, and mountain biking legend Gary Fisher is a special guest. 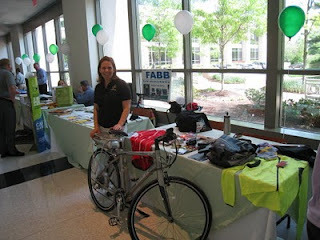 Representatives of FABB will be there with bike literature, Fairfax County bike maps, and the FABB newsletter sign-up sheet. The weather forecast isn't great, but there's a 50% chance it WON'T rain. We attended two Earth Day events yesterday to promote bicycling for transportation. The first was held at Oracle in Reston. 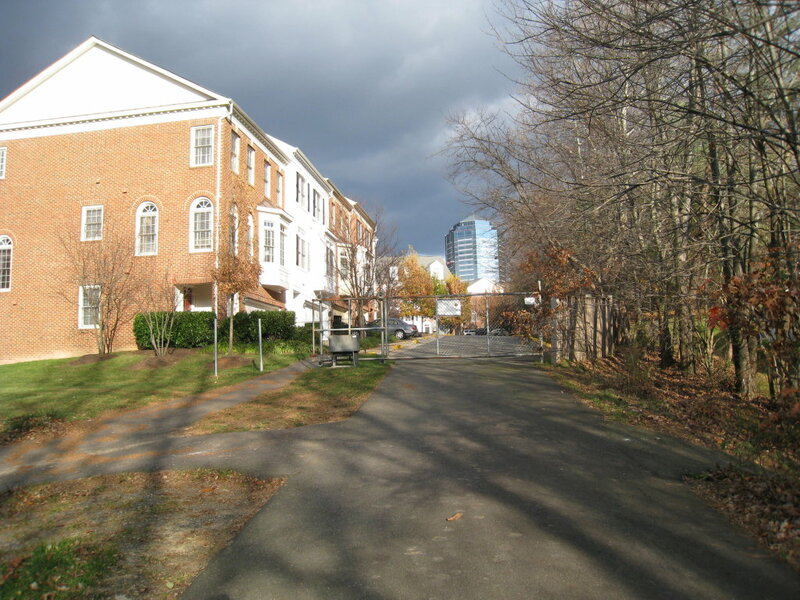 The office is located adjacent to the W&OD Trail, a great location for bike commuters. Several people do ride to work, although bike parking is insufficient. Those who can bring their bikes inside. Without county requirements for adequate bike parking in commercial and residential buildings, most bike parking in the county is sub-standard if it exists at all. Lack of bike parking is a major reason that people don't commute by bike. That's Anne Mader of The Bike Lane which has a shop in the Reston Town Center. She had a table adjacent to the FABB table. 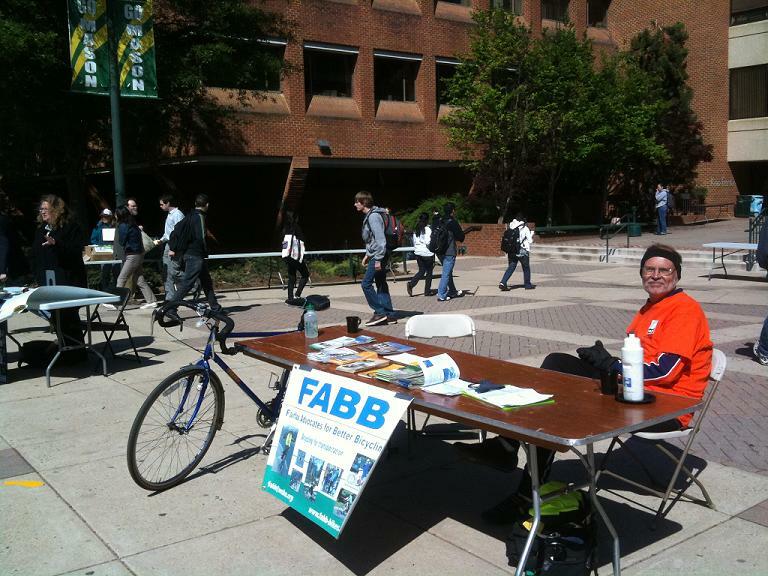 She's been a supporter of FABB since the very first meeting 5 years ago. She had one of the new Trek Ride+ electric bikes, which solicited a lot of questions from Oracle employees. The second event was the Vienna Green Expo (pdf) held later that evening. Bicyclists were well-represented with the Vienna Bicycle Advisory Commission, Spokes, Etc, bikes@vienna, and FABB providing info about bicycling to Vienna residents. Both Spokes and bikes@vienna are FABB supporters. Bicycling is really taking off in Vienna, which has a good grid of streets, is close to Metro, and has many new, younger residents who want a walkable, bikeable lifestyle. The Bicycle Advisory Commission is developing a signed bike route to the Vienna Metro station along Courthouse Road, through Nottaway Park to Vaden Drive and the station. There was a good turnout for the monthly FABB meeting last night. Cindy Englehart, VDOT Northern Virginia District bicycle/pedestrian engineer gave an overview of her trip to Europe with other bicycle professionals to check out innovative bicycle/pedestrian facilities for improving pedestrian and bicyclist safety and mobility. She described how in some locations cyclists are routed through roundabouts differently based on the number of lanes. Where there is only one lane, cyclists mix with other vehicle traffic. Where there is more than one lane, cyclists use a separate track parallel to the roundabout. In bus/bike lanes travel speeds are lower to facilitate the mixing of the two modes. She also showed an example of where cyclists are given multiple options for movement through intersections. 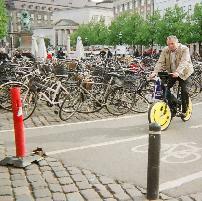 See the report of the project entitled Pedestrian and Bicyclist Safety and Mobility in Europe. After recent staff reductions, the NOVA bike/ped staff will have less time for reviewing bike/ped facilities contained in transportation projects. The two remaining staff will concentrate more on research. Charlie Strunk discussed bicycle activities in the county, noting that a lot of time is being spent installing bike racks that were recently purchased. We left the meeting early to provide testimony at the Planning Commission public hearing on proposed comprehensive plan language for the Tysons Corner area. We argued for bike facilities on Routes 7 & 123 and for funding of bike facilities in preparation for the opening of the Metro stations in 2013. We'll provide more info on the FABB meeting once the minutes are completed. Roads in Fauquier County are some of the most scenic in Virginia. Located in the county are the towns of Warrenton, Remington, and The Plains. Many cyclists ride there to enjoy the scenic views and challenging hills. Others ride to travel to work, the store, or other destinations. The Blue Ridge Challenge ride that starts in the town of Marshall is listed as one of the best rides in the Washington, DC area by Bike Washington. Narrow, rural roadways with high speed traffic and a lack of paved shoulders, conditions which force bicyclists to share the lanes with motor vehicles. Cyclists make road more dangerous—Cyclists have no rights to be on our major roads. There are plenty of side streets, neighborhoods and trails available to them. I do not want to share the road with them. For one thing, they do not pay for the privilege to use the road as motorists do in paying vehicle registrations, taxes on our vehicles, state inspections that make sure our vehicles are safe for highway travel or even road-worthy, and, most importantly, the insurance that motor vehicle operators are required by law to have. I have no personal vendetta for these people and can understand their desire to ride some of our scenic byways. The problem is, most of these scenic roads are winding with many blind curves and speed limits at 45 mph and higher. A couple of days ago, I was driving east on Route 55 from Front Royal and encountered two cyclists riding side by side, taking up almost my entire east-bound lane and forcing me to cross, illegally, the double solid line. "If these people want to risk their own lives with this dangerous activity and did not put anyone else in harm's way, then we could say that was their own choice. But for a bicycle to come through my windshield at 60 mph is unacceptable. This is an amazing letter. It's not a good sign when a letter to the editor contains a factual error in the first sentence. Shouldn't a legitimate newspaper have a policy not to publish an inflammatory letter that contains so many factual errors? We think it's irresponsible for the Fauquier-Times Democrat to publish a letter like this, and we're told it's not the first time a hostile anti-bicyclist letter has appeared. "Cyclists have no rights to be on our major roads" In every state in the U.S. cyclists have the right to travel on all roads unless otherwise prohibited, such as on many limited access highways. See: VA code 46.2-800: "Every person riding a bicycle, ...on a highway shall be subject to the provisions of this chapter and shall have all of the rights and duties applicable to the driver of a vehicle, unless the context of the provision clearly indicates otherwise. " "There are plenty of side streets, neighborhoods and trails available to them." Even if there were, this has no relevance regarding Mr. Rowe's duty to respect bicyclists rights to the road. Using the example that appears later in the letter regarding cyclists on Route 55, there are no connecting streets other than Route 55. 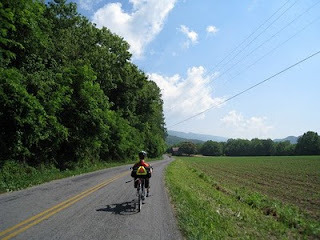 Since Fauquier County and many other counties have few on-road bicycle facilities and most trails do not connect to major destinations, cyclists must use most roads, not to mention the fact that riding on most roads is legal behavior. "I do not want to share the road with them." See above, Mr. Rowe has no legal option other than to share the road. "For one thing, they do not pay for the privilege to use the road as motorists do in paying vehicle registrations, taxes on our vehicles, state inspections that make sure our vehicles are safe for highway travel or even road-worthy, and, most importantly, the insurance that motor vehicle operators are required by law to have." The Wash Cycle recently covered this ground, with comments from "Contrarian". According to Federal Highway Administration statistics, 51 percent of the nation's $193 billion set aside for highway construction and maintenance was generated through user fees-down from 10 years earlier when user fees made up 61 percent of total spending on roads. The rest came from other sources, including revenue generated by income, sales and property taxes, as well as bond issues. Also keep in mind that the majority of gas taxes go to roads like interstates and expressways where cyclists often prohibited. Almost all other roads that cyclists prefer are overwhelmingly paid for by local and state taxes on property and sales. Also, most bicyclists own cars and pay all of the above-mentioned vehicle-related taxes. I have no personal vendetta for these people. Then Mr. Rowe goes on to talk about a specific case in which he confronted two bicyclists. "A couple of days ago, I was driving east on Route 55 from Front Royal and encountered two cyclists riding side by side, taking up almost my entire east-bound lane and forcing me to cross, illegally, the double solid line." Mr. Rowe was not forced to do anything. Legally, if the lane is not wide enough to share with a cyclist, he is obliged to wait until it is safe and legal to pass. See VA code 46.2-905 that states cyclists must ride as far right as practicable with several exceptions, including when "...substandard width lanes that make it unsafe to continue along the right curb or edge"
"If these people want to risk their own lives with this dangerous activity and did not put anyone else in harm's way, then we could say that was their own choice. But for a bicycle to come through my windshield at 60 mph is unacceptable." I'm at a loss for words. We plan to contact the Editor of the Fauquier Times Democrat to complain about their publication of this letter. Now is the time to get your tickets to the WABA Gala. It will be held this Friday at the Austrian Embassy, a short walk from the Van Ness-UDC Metro station. WABA has been a supporter of FABB for several years and this is a chance to celebrate and contribute to the work they're doing. The Gala is always a fun event, a chance to meet with other bicycle advocates, to partake of good food and beverages, and to get some good deals on donated merchandise through the silent and live auctions. Thanks to The Wash Cycle we learned that the Cross County Trail is closed (or will soon be, I haven't checked it) at the Dulles Toll Rd. until November 2010. Large equipment used for construction of the Dulles Corridor Metrorail Project will block the trail at the Difficult Run bridge. Unlike similar construction at the W&OD Trail and the Dulles Toll Rd, there will be no detour provided. Read the County Park Authority news release Temporary Construction Closure Set For Northern CCT. Whenever a major trail is closed a detour should be provided. In this case it would be difficult to provide a detour under the Toll Rd bridge due to limited space and the presence of the river adjacent to the trail. However, if this were the W&OD Trail, we're confident that the N. Va. Regional Park Authority would find a way to create a detour. One option if you're headed north is to head east to Squaw Valley Dr. We've heard there is a dirt path leading from the CCT to Squaw Valley but we've never checked it. Take Squaw Valley Dr to L on Lozano Dr to L on Beulah Rd, cross the Dulles Toll Rd, continue on Beulah to L on Days Farm Dr just after the bridge. There are tennis courts located at the bottom of Days Farm Dr with a trail that connects to the CCT. We'll try to check out this rate as soon as we can. See Google map of the area. Map. Update: According to the map Cross County Trail - Dulles Highways to W&OD Trail on the Reston Paths website, there are connections to Squaw Valley Dr and Days Farm Dr. The Request for Proposal for the Tysons Bicycle Plan was released yesterday. Work should begin in the next couple of months. This will be the first concentrated bicycle planning effort to be conducted in the county. Since a great deal of data were collected during the production of the County Bicycle Route Map, the time and effort needed for data collection should be reduced. This will allow the contractor to concentrate on analyzing existing conditions and planning proposed future facilities. The study will include recommendations for end of trip facilities including bike parking, showers, and changing facilities. There is currently very little short or long term bike parking in Tysons. Also, Tysons would be one of the better locations in the county for implementation of the county's first bike share system. The contractor will likely determine the cost and feasablity of implementing such a system. Back in early 2009 a group of county staff and FABB members developed a conceptual bicycle plan that we presented to the Planning Commission Tysons Committee. This plan formed the basis of the bicycle network included in the draft plan language. Now it's time for the professionals to take over. It's an exciting development and we look forward to working with county staff and the contractor to develop a plan for making Tysons more bicycle-friendly in the future. We've started teaching Traffic Skills 101 courses in Fairfax this year. For many years Allen Muchnick has taught this course in Northern Virginia, mostly inside the Beltway. The course was developed by the League of American Bicyclists with the goal of teaching bicyclists to ride safely in traffic. Vehicular cycling or effective cycling "is the practice of driving bicycles on roads in a manner that is visible, predictable, and in accordance with the principles for driving a vehicle in traffic." The concepts are embodied by the statement that "Cyclists fare best when they act and are treated as drivers of vehicles." Through the use of vehicular cycling techniques, cyclists can learn to control traffic by lane positioning. When a lane is too narrow to share, "taking the lane" is the best, safest strategy. With practice this technique becomes second nature. It improves cyclists' visibility, both between and at intersections. Cyclists also learn how to avoid dangerous situations by practicing skills such as the quick stop, rock dodge, and instant turn. These skills will become second nature and could save your life. Most people in the U.S. have never been taught how to ride properly in traffic. They may have learned how to "ride" a bike, basically how to propel the bike forward without falling. This has nothing to do with learning proper riding techniques or understanding the principles of traffic law. Is it any wonder that many people don't really know how to ride in traffic? The classes are 9 hours over two or three days. The first class was held at the Vienna Community Center, with classroom instruction for three hours on a Thursday, and classroom instruction, parking lot drills, and the road test on Saturday. Three completed the course. The second class was held at the Reston Community Center on two Saturdays. Four students completed the course and received certificates. Two additional spring courses are scheduled for April 22 & 24 and May 13 & 15 in Herndon through Fairfax County's Adult and Community Education program. We attended the Keep Tysons Moving event recently at the Capital One building just inside the Beltway off Route 123. Not exactly a bike-friendly area. The purpose of the meeting was to provide an update on all the construction projects in the Tysons area and to discuss the various alternatives to driving along. The main projects in the area are the HOT lanes project, construction of the four Tysons Metro stations, and widening of Route 7. We had a table with information about bicycling in Fairfax. 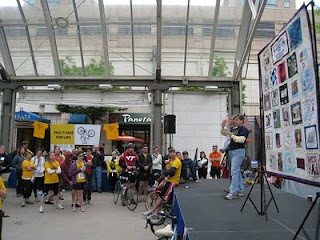 Several people wanted to know about bike routes into Tysons and what was being done to make Tysons more bike-friendly. While there are several bike routes into Tysons, not much is being done to make conditions better in the near term. Route 7 is only getting worse now that the service roads are being removed. While we support most aspects of the new Tysons plan, in our opinion the biggest flaw in the plan is the lack of bicycle accommodations on Routes 7 and 123. Between Route 123 and the Dulles Toll Road there are no bike facilities planned for Route 7. Cyclists will either ride on the road or contend with pedestrians on the sidewalks, which is always a bad idea, especially in a congested area near transit. At the Keep Tysons Moving event we learned that as part of the VDOT MegaProjects Employer Solutions, the bicycle commuter benefit for Tysons employees is doubled to $40/month (100% VDOT MegaProject match of the $20/mon employer benefit). If you work in Tysons and commute by bike, and you're employer is not providing the bicycle commuter benefit, this is a great incentive for implementing it. When this was announced, the program manager pondered why anyone would want to commute by bike to Tysons. Now that's certainly a strong endorsement of bike commuter from the team that is trying to get people out of their cars. From the MegaProjects web page on Commuter Solutions, it seems like Northern Virginia is a cycling paradise: "Most communities in Northern Virginia have been built with bikers and walkers in mind—there are paths, trails and bike lanes all across the region." The Northern Virginia Transportation Commission (not to be confused with the Northern Virginia Transportation Authority, and especially not to be confused with the pro-roads everywhere group Northern Virginia Transportation Alliance) has just released a report entitled A Guide to Bicycle and Transit Connections in Northern Virginia. The guide is mostly a summary of existing info related to bikes and transit in N. VA. There's a section on Innovative Ideas from Other Metropolitan Areas including high-capacity storage in Chicago, bike shelters in Switzerland, and the Bike Tree. There's also mention of the new FTA policy to increase the area considered served by bicycles to three miles. This blog is now located at http://fabb-bikes.blogspot.com/. 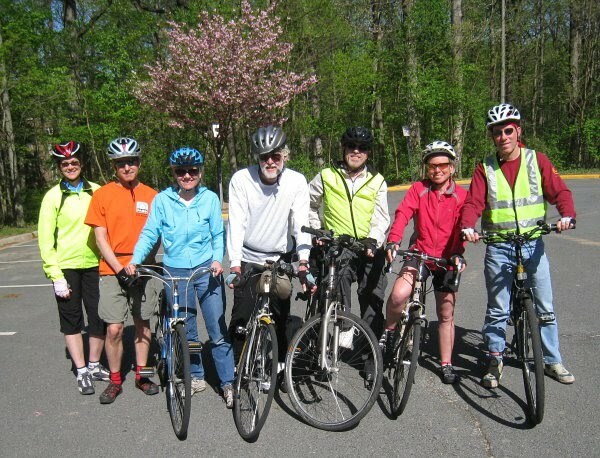 The Reston Bike Club has been holding Tuesday evening rides in Reston for many years. They are very popular and often attract over 100 cyclists. To avoid having one very large group, cyclists are divided into 5 classes based on average speed, from 1 (22+ mph) to 5 (14-16 mph). I often hear about the rides, mostly from motorists who complain about rider behavior. As you can imagine, the faster cyclists aren't inclined to obey most traffic control devices. There is a pretty firm rule against going straight through a red light, but stop signs are mostly ignored as are red lights when turning right. I decided to join the "slower" 5s this Tuesday to see for myself. I never did see the 1s once they left the parking lot, but we did see the 4s about halfway through our ride as they turned right at speed through a stop sign. After our group blew through a four-way stop intersection I suggested perhaps we should stop at stop signs. This advice was ignored at first but when I persisted I was told that I must be new, as the group generally didn't stop at stop signs. They didn't run red lights (expect when turning right), but it was unreasonable to stop at every stop sign. Most motorists do the same thing. The next time you're at an intersection with a stop sign, notice how many motorists come to a complete stop. A while back I recorded a video of motorists rolling through a four-way stop intersection at Church and Center Streets in Vienna (while eating lunch at a good sushi place on the corner). Some motorists do slow down or stop when they absolutely have to when a car is turning in front of them, but most roll through. The problem is when this happens with pedestrians present. Almost no one stops for right on red or at a stop sign any more. Many crashes with pedestrians, and cyclists, those who are foolhardy enough to ride on the sidewalk against traffic, occur in these situations. The only time I heard a horn honk while filming in Vienna was when a motorist honked at another motorist who had stopped for a pedestrian. I guess the club cyclists aren't really behaving much differently than motorists. Since most of them drove to the ride, I assume most of them are motorists and when they get in their cars, they act much the same. I just don't think it's right. Motorists and cyclists in places like Europe are much more law abiding, and I suspect have lower crash rates. The club cyclists in Reston are giving cyclists a bad name, and most don't even think there is a problem. Just because it's inconvenient to slow down for a stop sign or when turning ride on red, and motorists do the same thing, doesn't make it right. We are supposed to have the same rights and responsibilities, and until we act like we deserve these rights, we'll make little progress. As a side note, it's a bit ironic that last Saturday I had tried to get permission to use this same parking lot for parking lot drills in a Traffic Skills 101 class and was refused. I needed to ride to the county courthouse yesterday. It was a beautiful day and a nice ride from Reston to Fairfax City. When I arrived I didn't notice the rack in front of the main entrance, so I parked near the front door. As I was leaving I noticed the rack on the right. I'm not fond of the wave rack since there's only one contact point with the bike compared to the U rack, which is the standard in most places. Bikes are supposed to be parked perpendicular to the rack. As you can see, when used properly bikes end up in the flower bed. What many people do is park parallel to the rack, which turns a 5-bike rack into a 1- or 2-bike rack. In this case, the 10-bike rack becomes a 2-bike rack. moved that the Board direct staff to investigate and report within three months how other jurisdictions are addressing these issues and develop specific standards for the County to use as part of the land development process, and to further examine how these standards could best be introduced whether through adoption of a Board Policy, an amendment to the Zoning Ordinance, or incorporation into the Public Facilities Manual. The guidelines are still under development. We continue to ask about the status but have never seen draft guidelines although we've been assured they are due any day now. Staff do work with new developments to request racks and provide guidance regarding placement, but almost every new rack that I've seen in the past couple of years is incorrectly placed and of the wrong type. The county bike program needs more resources for this type of work, and yet the county executive has proposed cutting all operating funds from the program. Bike to Work Day is coming up on Friday, May 21 at 35 regional pit stops. There are seven events in Fairfax this year, with two new locations; Herndon at the Town Hall Green; and Merrifield Park in Merrifield Town Center. Other Fairfax County events will be held at Fairfax Corner, Reston, Springfield/Metro Park at Walker Lane, Tysons Corner, and Vienna. Registration is now open on the WABA website. For some of us every day is bike to work day. The official Bike to Work Day event is a great opportunity to celebrate the benefits of bicycling to work, to shop, to school, and all the other places we travel. We're signed up to speak before the Board of Supervisors today to request that funding for the bicycle program be restored. After the WABA alert about the proposed budget cuts, hundreds of cyclists emailed Board members asking them not to cut operating funds from the bicycle program. This is an opportunity to speak to the Board directly to reinforce that message. Our main point will be that "we understand that most programs will receive reduced funding this year. Singling out the bicycle program for a 100% cut in operating funds, on top of having cut over $100K from the program last year, sends the wrong message to county residents. When most local jurisdictions are expanding their bicycle programs, we should be too." In a new video from Portland Mayor Sam Adams' vimeo channel, "Catherine Ciarlo, Transportation Policy Director in the Office of Mayor Sam Adams in Portland, Oregon, explains how cycle tracks and buffered bike lanes work." On the Right Track from Mayor Sam Adams on Vimeo.